Until recently I had not heard of WriteShop, a company that has writing programs for children from PreK through high school. They sent me two Ebooks Story Builders: World of Animals and StoryBuilders: World of Sports to use with our girls and review - and both of my girls have loved them! Laurianna enjoys writing stories on her own, but when it comes times for a specific writing assignment, both she and McKenna start whining and complaining when they have to write more than one sentence. Needless to say, assigned writing is not always a joy during our school time. We started using the StoryBuilders as a fun activity/creative writing assignment and McKenna alone began writing unbelievable amounts! Primarily we've used StoryBuilders: World of Animals ($7.95). 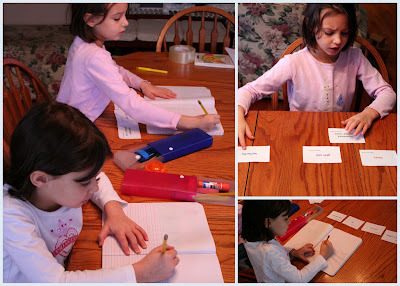 First we printed off word cards and sorted them into piles. The word cards can either be printed onto different colors of paper and sorted accordingly, or you can print them off using colored ink and sort them that way. Each card deck/color represents a different part of a story: character, character trait, plot and setting. Once there was a little boy who went in an amusement park. He found his bat. He said, "Why is it in here?" He was very confused. He saw a trap hanging from the ceiling. He was not fast enough, so he got caught in the trap! While I realize not all of the story makes complete sense, this story was a huge step for McKenna! And she was so proud of the story and even drew pictures to go along with it. While the StoryBuilders are not an entire curriculum for writing, they are a great activity to use once a week for getting the creative juices going. 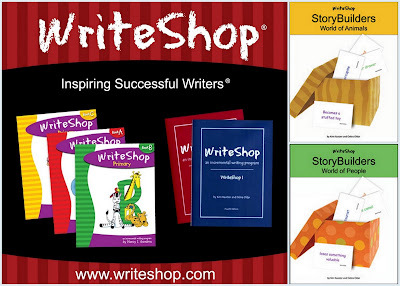 WriteShop does offer full writing programs for children Kindergarten through high school. And as a bonus, The Old Schoolhouse Store is offering a FREE download this week for the StoryBuilders: World of Animals - a $7.95 value! Be sure to head there to take advantage of their great offer! If you would like to read more on Write Shop, check out the Homeschool Crew blog and see what others are saying. Thanks for sharing this, I downloaded the free one and want to try it out with Pac Man. I think it will be right up his alley! This looks really cool - I downloaded it, too. Thanks! Thanks for pointing out the free download to me. I can't wait to use it this week! The Letter E is up for Preschool Corner!